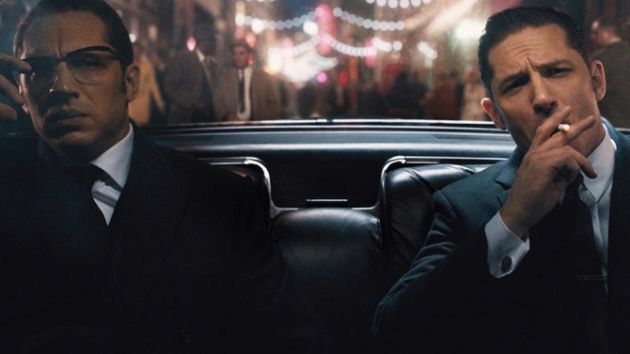 The Krays, the notorious twin gangsters in swinging 1960s London are played by Tom Hardy. Ronny is the crazy homosexual one and Reggie is the smooth operator type. I don't know how truthful the Hegeland's script is to the true event, but unlike its gritty, more abstract the 90s predecessor by Peter Medak, simply called The Krays, Legend charts the more conventional narrative and plays out more as a comedy, not as a psychological drama. Even with its sporadic violence, the brothers never come across as scary. With his naturally nasally voice, Reggie resembles a torn down, romantic version of his Bronson performance while his Ronnie, always speaking his indecipherable, I-have-pebbles-in-my-mouth mumble is close to his Bane. Considering that they were identical twins, Hardy/Hegeland's decision to portray them completely separate is an odd choice. But it's always fun to watch Hardy. Legend comes down to Reggie being a faithful brother's keeper, even if that causes their eventual doom. It gets more and more tiresome to watch films by so called Hollywood screenwriters. Hegeland has nothing much to offer other than relying heavily on Hardy's charm, so he insists upon meaningless/completely unnecessary voice over device by Reggie's young wife (Emily Browning). But all in all, it's a well crafted Hollywood movie with a lot of good British actors.